Anyone who has followed college basketball the past few decades probably knows a good Rick Majerus story or two. There was the time he promised to quit at Utah if false allegations that freshman Britton Johnson had used a racial slur during the 1998 NCAA tournament turned out to be true. Or the day in 2005 when while working as an ESPN analyst, he favorably compared footage of actress Ashley Judd at a Kentucky game to watching adult videos in his hotel room. 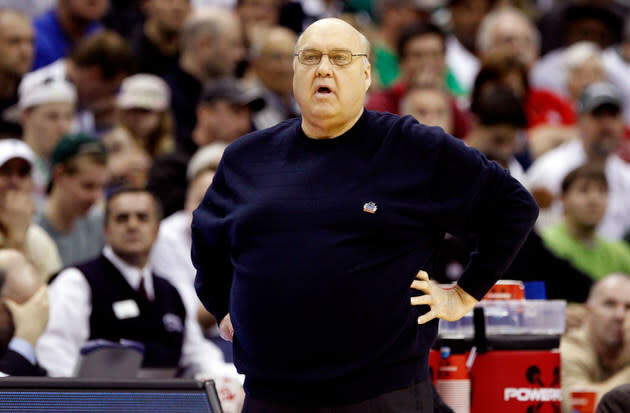 Or the introductory press conference at Saint Louis in 2007 when the school president began his speech by explaining Majerus' last name meant "great" in Latin only to have the coach correct him, telling reporters, "I think it means sausage-eater." Examples like those of Majerus' rollicking sense of humor and larger-than-life personality are one of many reasons he'll be missed in college basketball circles. The former Utah and Saint Louis coach died Saturday at age 64, barely three months after he took a leave of absence from his job as head coach of the Billikens citing heart issues and other health concerns. Majerus' girlfriend confirmed the news of his death to USA Today on Saturday. The legacy Majerus leaves is as multi-layered as his personality. He was a brilliant strategist, an off-the-cuff comedian, a devoted family man and a tragic figure who battled weight issues. Majerus amassed a career record of 517-215, taking Ball State, Utah and Saint Louis to the NCAA tournament a total of 11 times and leading the 1998 Utes on an improbable run to the national title game. Along the way, he built a reputation as an Xs-and-Os mastermind, more comfortable turning a group of lightly recruited players into a formidable team than coaching at a "Cindy Crawford program" as he often referred to the North Carolinas and Dukes of the world. Majerus might have accomplished even more in basketball were it not for health concerns caused by his weight issues and love of food. In his first season at Utah in 1989, he underwent coronary bypass surgery six games into the season. He later left the Utah program in 2004 after being hospitalized again for heart problems earlier in the year. When Majerus took a leave of absence at Saint Louis in August, the school initially did not rule out the possibility he would return to coach the Billikens for the 2013-14 season. As the weeks went by, however, and reports surfaced that Majerus' condition had worsened, it became clear that he had coached his final game. What's especially tragic about Majerus' death is that he was vibrant and in good spirits this time a year ago. With the death of his beloved mother behind him and no major health problems of his own, Majerus seemed rejuvenated last season. He was in great spirits as the Billikens cracked the top 25 for the first time in his tenure, made the NCAA tournament and even thumped Memphis before falling in the Round of 32. During one press conference in Anaheim after Saint Louis had just defeated Villanova in the semifinals of the 76 Classic, a jovial Majerus hammed it up with reporters as though he didn't have a care in the world. He bemoaned the lack of an authentic custard stand in Southern California. He told stories of his players white water rafting and cliff jumping in the Ottawa River. And he kidded that "there would have been the first tsunami ever in a river" if he had joined them. Quips like that are one of the ways Majerus will be remembered. It's just extremely sad he won't be around to make a few more of them.